Katherine will be back on Thursday to discuss #literarycrush and #literaryconfessions- among other things! What was the inspiration for The Lost Husband? I have a childhood friend who lives on a goat farm. He and his wife actually quit their city jobs and moved out to the country to raise goats, make cheese, and live the good life. Several years ago, we took our kids out to visit them and see the farm, and I was totally amazed at how charming it was. By the end of the weekend, I knew I wanted to try to set a book on a goat farm. Are any of the characters in The Lost Husband based on people in real life? Or are they just characters you imagined? The people in The Lost Husband are all fictional. Writing stories is kind of like making a collage. You take bits and pieces from everywhere—something you dreamed, a story your mom told you, something your son said, a haircut you saw on somebody in the grocery store—and you mix them all together in the service of your story. That said, some of my characters do have traits of people I know. The way that Aunt Jean is such a great listener and can find a way to care about whatever Libby’s talking about? That’s my awesome mom, right there. My husband is a volunteer firefighter, so I snagged that piece of O’Connor’s character from him. And Libby reminds me of me in certain ways—especially when she’s worrying too much. Need to work on that. Can you describe The Lost Husband in 10 words or less? A woman finds a new life after losing her husband. Will you be going on a book signing tour? PEOPLE Magazine invited me to a book party they had up in New York (and gave The Lost Husband a great review) right after the book came out, so I went up to NYC for that. And I’ve done lots of events around Texas. Luckily, I’m able to do a lot online (YES—I will Skype with your book club!! ), which is great for me, since I’m a mom, and it’s always so hard to leave my little ones! If I could conjure a perfect writing routine, I would wake up, make coffee, and sit right down to write (preferably in a gorgeous historic estate with a sunroom overlooking a river). As it is, I get up and scramble around in the mornings, getting everybody off to school. Once that’s done, I take a deep breath and, on a good day, sit down to write. (On a not-so-great day, I wind up doing laundry or dealing with a broken dishwasher or driving to drop off a forgotten lunch box). I have a laptop, so I work at the kitchen table a lot, or in a big comfy chair on our sun porch. And then I just write like crazy until it’s time for afternoon carpool. Would you want The Lost Husband to be made into a movie? If so, do you have a cast in mind? I’d love to see it as a movie!! I’d especially love to see the scene where Libby gives O’Connor a haircut and shaves off his beard. It would be fun to see that transformation on the screen. As for who to cast, it’s a fun game to play! It’s always kind of hard for me, for some reason. But I’ve heard some great suggestions from readers: Ryan Gosling for O’Connor. Amy Adams for Libby. Kathy Bates for Aunt Jean. Katherine- what are you working on next? Can you give us any hints? I just got a three-book deal with St. Martin’s Press, and I’m working to finish the first of those three this summer. It’s about a woman who goes on a wilderness survival course with her little brother’s irritating best friend. I am 2/3 of the way through the first draft, and I’m having a great time with it. *Special thanks to Katherine Center for agreeing to be interviewed! Katherine Center is enjoying life (as you can tell in this pic (taken at the People magazine party! )- she’s got a big smile on her face!) Not only is The Lost Husband a Deep South Magazine Summer Reading List selection– she’s recently signed a three book deal with St.Martin’s Press. When not writing, Katherine can be found on her website, Twitter, Pinterest and Facebook. 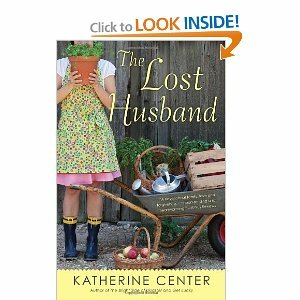 *Giveaway: Comment for a chance to win The Lost Husband! Be sure and include your email (you may use the AT and DOT). Giveaway is open to US only (sorry!) Giveaway is open from August 20- Aug 27th at 11:59pmEST. Winner announced Aug 28th. I have loved all of Katherine Center’s books. The Lost Husband was no exception. Her books always make me laugh and sometimes cry…so very good. Thanks for sharing your interview T :). What a wonderful interview. This book sounds unique and memorable. Thanks for this lovely feature. I just checked this book out from the library. Can’t wait to start reading! Lots of buzz about this book! This looks great! The cover makes me happy, which is always a plus. I have been wanting to read this book since Brene Brown recommended it on her blog. Great interview! Thanks for hosting a giveaway! Best book yet and I LOVE everything Katherine writes. The book sounds exceptional. Thanks for the giveaway. Kudos, Katherine. Wow! That’s a great endorsement! Thank you for stopping by! This is definitely on the TBR list! sounds amazing! The giveaway is now closed! Thank you to all who entered! The Winner is: Melody Simons! Look for an email from me today!